Follow Dina – Hanne Siebers on Instagram! This entry was posted in England and tagged Art, fugacity, Hanne Siebers Foto, Nikon, still life, Stillleben, Vergänglichkeit. Bookmark the permalink. Indeed, there was a school of the classic baroque still lifes called “Tierstücke” (animal still lifes) which used live or rather dead animals. But the classic early Baroque still life mostly avoided living or even dead creatures. We had to check the right spelling of “still lifes” as well. Die weiß der Schimmel mit den Hufen abzuwehren – WIEHER! Still practicing? I’d like to see someone try to outdo her! Great job, Dina. The balance is perfect causing your eyes to encircle every item. It’s always fun setting up such still lifes to produce the perfect stimulus for the eyes of the onlooker. We wish you a wonderful day. We are nearly off up North. Siri and Selma are already very much excited. Have a grand time. All four of you seem to know how to enjoy life, so I’m sure you will. Toll, dass dir unsere Stilleben gefällt. yes, it is meant to be like this, exactly! This is a very beautiful, well thought out and lit frame. Love the light and the textures. Pure class! the Baroque still life paintings in Flanders of the17th c. with their symbolism. And of course symbolistic pictures need low light, the darkness where all symbols come from, the mysticism. Love the sumptuousness about it – rich colours and the black background has an allure of mystery. i recently received an ‘art’ scarf – a copy of Ambrosius Bosschaert the Elder’s Still life of Flowers in a Wan-Li vase…. so luxurious. Love your creative photographic representations, Dina. Brings a new element to your work. These still lifes are a marriage of Baroque paintings and modern photography. I really like this combination of old and new and, of course, the symbolism mixed with a certain dose of mysticism. As you do I see Dina’s still lifes as new dimension and style in her photography. Das schönste an der Vergänglichkeit ist, daß der Augenblick nicht zurückkehrt –die Erinnerung daran jedoch unsterblich ist. Wie Dinas Fotos und Kbs Texte, wunderbar harmonisch! Schön, dass dir unsere Bilder und Texte gefallen. Uns geht es um eine realistische Harmonie. Ach ja, und wie Per Magnus schon schrieb, der erste Satz gefällt auch uns SEHR. This is a beautiful shot…and quite chilling too! Chilling was not an association we had when producing this still life – but your are right, real beauty always has a chilling side otherwise it’s kitsch. Lovely composition. Despite being dark it is very vibrant. I absolutely agree! Dina should concentrate on still lifes. And that fits very well our blog, as in the still lifes of the baroque emblemata text and picture are equally important and the both reinforce each other. We are quite busy now as our holiday starts at the end of the week and we have a change of guests at the same time. But we are so excited going up North. What a Great picture! Well done! I want to see more still lifes! I thought my first comment didn’t appear. Today everything is hectic, sorry. We know that as well! Good idea to try out what it will look like in black and white. We were quite influenced by paintings of the 16th and 17th c. therefore we didn’t think of black and white. A great 21st century take on a 17th century theme. You are absolutely right, that it is and this was our aim to merge Baroque with post-modern times. Old and new, modern and ancient – a perfect combo in your eyes and lens. Harmony. as we just wrote above, this was meant to be. Baroque meets modern low-key-photography and they go very well together, don’t they? And it’s amazing how this 400 years old art still looks interesting and is inspiring. Thank You for sending harmony to us all. Sweet fayeries, such a good thing – these pictures would do good hanging on any wall, meeting any eye and any soul. Dina actually exchanged one of her still lifes with Susanne Haun, an artist who is blogging here as well. What an eye for synergy. Nicely done. Synergy – that’s what it’s all about, isn’t it?! einmal ganz abgesehen von der exzellenten (fotografischen) Technink auch einmal mehr eine wundervolle Komposition! ich hätte ja nie gedacht, dass ich Dina mit meinem Wissen aus dem Grundstudium Germanistik helfen könnte. Ich spezialisierte mich damals auf Barock, die Emblemata und Sonette von Gryphius & Co. Ich hätte überhaupt nie gedacht, dass ich dieses fast vergessene Wissen noch einmal benutzen könnte. Aber jetzt kommt es gut zuammen, Dinas Fotografie und meine Texte und unsere Ideen zur Komposition. Mich fasziniert hieran auch, wie der “time gap” von 400 Jahren fein überwunden werden kann. Übrigens das Bild “Der Magus” vom letzten Blog war ja im Grunde auch ein Stilleben. I love the light on the bottle. The brick brings it firmly into the modern era too. Nice work, Dina! Beautiful colors and texture, perfect lighting and composition! An amazing still life image!! we are very happy that you like Dina’s photography 🙂 Siri and Selma like setting up those still lifes to be photographed by Dina and our dear Master gives his advice. Dina has a great eye for what looks good and she’s quite the professional with her photography. Wonderful photo! Such kind words from Anneli! 🙂 Thank you! We think so too, Dina is GREAT! Everything in this amazing still-life points to the ephemeral nature of life: the moss covered brick, the empty bottle, the shriveled rose hips, the dried up seed pods. Yet, all objects hold the promise of new life. Well done, Dina! I will check Instagram to see if your image is there too. Greetings from rainy Canada! actually nearly all of the classic still lifes of the 16th and 17th c are based on the topic of life and death. You are absolutely right we wanted to express death, hope, resurrection – memento mori but do remeber there is always something new born – like this inspiration from 400 years ago being revived with modern low key photography. Actually we suppose there are hardly any painters around who are able to paint like the Flemish painters of the Baroque. we desperately need some rain here. But actually it’s every year like this as we are situated in the shadow of the western parts of England. Send some rain over to Norfolk, please! Wishing you and Biene a happy weekend. We are off for a holiday up North, Orkneys and the northern coast of Scotland. Das finden wir aber echt toll, dass dir unser Blog so gut gefällt. Das gibt direkt Schwung, fröhlich und emsig weiterzumachen. Wir fahren jetzt allerdings erst einmal in den höchsten Norden der Insel, zu den Orkneys und der Nordküste Schottlands, worauf wir uns schon sehr freuen. Vielleicht wird Dina einige Fotos von dieser kargen Landschaft posten. Aber wir werden auch einfach nur faulenzen und das Nichtstun genießen. Alles Liebe dir und bis dann. Die sind hin und her gerissen – aber auch faul, naja, sie schreiben nur auf unserem Blog hier, aber freuen sich wie die Schneekönige über jeden Follower. Enjoyed your selection and juxtaposition of those choices. thank you very much! 🙂 We are always looking for things we can use and combine – oh dear, our conservatory gets more and more full of junk. We especially love to merge opposites in those pictures. oh dear, we had to look up “denizens” – but that’s exactly what we are. We are off to the North. Wishing you a great time. We will block again when we feel like – and we feel free using the privilege of being lazy during our holiday. … and we are sooo excited and having travel nerves as well. Exquisite!!! Still life with a wonderful energy! 🤗🤗🤗 Hugs and much love to my dear friends the Fab Four of Cley! Hugs to the most wonderful friends – the Fab Four of Cley!!! !🤗🤗🤗🤗 Safe travels! A wonderful still life! I love the mossy brick. I hope you all enjoy your holiday! 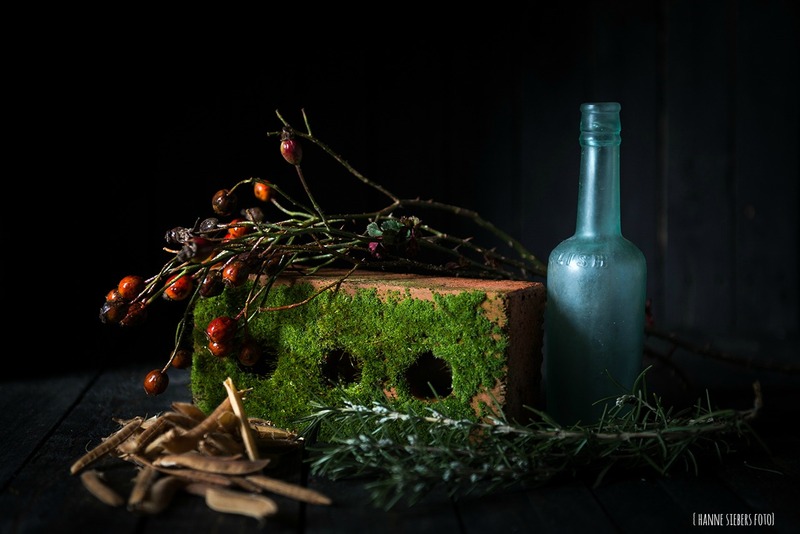 We started building this still life with this mossy brick from our garden and then went from there. We sure having a great holiday. We have never been that far north on this island here before. Fantastic objects and beautiful light! We are VERY happy that you like our art work. We love still life paintings very much as well. It’s amazing how well those Baroque artists were able to paint and the mood they produced in their paintings. It were times when lots and lots of people were dying and one can feel this morbid atmosphere in those still lifes of the 16th and 17th c.
Hello Fab Four. Yes, I think part of what attracts me to still life paintings is the knowledge that they have such deep meanings and can tell us so much about the life and culture of their time. From Aotearoa, my little corner of the world, Nga Mihi Nui (my best wishes). we are leaving now to our favourite areas of the world, the North. Hi Fab Four; glad to hear that. I hope the rest of your trip will be wonderful too. We send lots of love around of the world to Aotearoa (oh dear, we had to look it up in our encyclopedia). I should have provided a translation! Maori is such a beautiful language and I am trying to learn it and use it more. It is our second official language, but not used enough. You give STILLESTÅENDE a new meaning, love your work and the conversations here. thank you sooo much for your kind words. We are looking so much forward to our journey up North! I love the conversation here as well, very much so! We learn quite a bit answering all the commentaries and, of course, producing our posts. Therefore we love this communication on our blog and thank you all for it! Thanks for wishing safe travels. We are sure having a great time up north and that we will come back home happily. The textures and reflections are so compelling! Love this! This is making me want to try still life photos 🙂 How was this shot set up? Actually the set up of the objects is at least as important as the photography. To get the right dose of harmony and tension and the hidden philosophy of those still lifes. Still lifes have always been a philosophical art, not just “nice pictures” and this philosophical background makes their magic and rules the set up. I can tell you had fun putting this together, and I like the idea of anchoring it all around a moss-covered brick, very unexpected. Such lovely colors too. Have a great holiday away! Apologies for repeating myself, but your (Dina) photography just gets better and better. I have never attempted a still life and I think it is harder than it looks to get the balance right. Love the moss-covered brick! And have a fab holiday fab four in the Orkneys, I can only imagine the wonderful photos you will bring back from there. Just make sure those girls are well tethered as I suspect it will be a little windy up there! I just packed special ropes for our sweet little Bookfayries in our car’s boot. Those ropes are colourful, weight nothing and are a bit like rubber bands. They hold our dear ones safely. Siri and Selma are already sooooo excited. Actually I as well. I wonder how we will get all the equippment in our estate. Harmony and tension is the key to still lifes as well as life and death in the end. It’s a philosophical art always hiding a deeper meaning. We started with the moss covered brick and went from there. This is lovely. What catches my eye immediately is the colour green – the branches of the rose hips, the vibrant moss, the soft green of the rosemary and the wonderful, almost frosted green of the bottle. So cleverly put together! There’s no app for a pc and that’s what kept me away too, Jude. But I have found a way to use Instagram on my iMac! !😇 I bought Flume (10$) and no it works easy peasy. You can post all your photos by drag and drop. Klausbernd has an Instagram account too now (selma helped him) and he used his iPad to insert a photo. I don’t know what to think about Instagram actually. I had an account for two years or more and never activated it until this week. We want to stay happy bloggers and at the same time, not spend so much time on the net. When we blogged about Instagram, we immediately lost 10 followers. Coincident? On the other hand, I have seen many ex-bloggers (the ones that suddenly stop from one day to another without a notification) now happily posting their photos on IG. We refuse Twitter as well as Trump is using it. we are so happy that you like this still life. It all started with the moss covered brick and then we went from there following and partly breaking the priciples of the classic Baroque still lifes. Tension and harmony of the colours is one level, as you noticed. Our dear Master doesn’t use his smart phone as well. It’s not his style, how he puts it. So we, Dina and the clever Bookfayries, are in charge of his instagram account. We suppose he doesn’t really understand what instagram is for. He prefers blogging, whereas Dina likes instagram for presenting her pictures – not iPhone-pics but real pics! We don’t know what it is, but exactly since we mentioned that we are on instagram we lost already 15 followers until now and that in 2 days. This is very unusual as the highest number of losses in 2 days was 2 followers until now. Is instagram the devil, you are not allowed to mention? Are we naiv bloggers being active on instagram as well? We have no idea how to understand this effect. We know this that exactly as our dear Master keeps a statistic of or blog every day for the last 6 years. Has anybody an idea how to understand this effect? This is very nice. Such a beautiful composition with low light and thoughtful wording. Still life photography can be really interesting, but too often we see dull arrangements and most of all the light is not right. From the comments, I take it that you are on your way to the North. Have a great holiday! thank you very much for liking our post. We absolutely agree, still life photography is quite often boring because it’s only seen from the technical aspect of photography. But of course since the beginning of such still lifes in the 16th c it was always an art expressing a philosophical message. Without such a message a still life lacks dimensions and tension and it’s not that differen from modern advertisment-photography. We suppose that digital photography seduces the photographer just to go in more and gadgets forgetting about other dimensions of a picture and especially the philosophical dimension that’s part of every artefact. Therefore all “nice” pictures look alike. The photographer plays around with a dramatic horizon or an unnatural sun as it is in nowadays. But why? This kind of still life photography is the opposite. The photographer reflects what he/she wants to express, why he/she arranges the objects as he/she does. And isn’t this more interesting than thinking about filters and computer programmes for post production? Here we want to bring an old school of art together with modern technologies. We try to revive photography with the Baroque demands on art. Our dear and clever Siri sees this as a move against “mindless photography”, as she calls it. We and especially our dear Dina surely will go on in this direction. to make it clear, what we were laughing and complainig about: In most of the photoblogs you find commentaries like “great”, “what a nice picture” and other meaningless commentaries. On the other hand the photographers are quite often speechless as well. We Bookfayries want to give photography a sense again. And we push Dina in this direction. Your thoughts about blogging as the combination of words and pictures and your thoughts about an iconographic language are very important. I am with you with your critique of the mindless pictures flooding many blogs. What makes a picture meaningful is the basic question or with other words what makes a great picture. Does a picture needs a text? How can combining pictures with texts create something new, a new dimension? Your blog is really special as it reflects blogging on a high level. I hope you go on in this direction. Should I say you are writing a prolegomena to a theory of blogging? You do and I am happy about your thoughts. They transform blogging to an interesting way to find a language beyond cliches. After I read your answers to the comments I will blog in different way. Thank you! Last not least I admire Dina’s photography. The language of her pictures stands out of the masses of “nice pictures”. I really like how you are on the way to your own individual language. Go on! Fabulous you are! If this photo is any indication, Dina doesn’t need any more practice – she’s nailed it!!! Wow, that’s a brilliant still life! Oh this is a beautiful composition! It’s absolutely fantastic following you. Your talents are unendless. Knowing you personally makes your blog for me super interesting and special. It’s like a ” lucky bag” every time. I always think “this is the best ever” and then the “next, even better” turns up. You won’t loose me as a follower even if you prefare Instagram. Maybe you can explain it to us bloggers ( who don’t exactly know what it is). Would really appreciate hearing about it in your words. Oohhh! I can hear some strange comments!! Very beautiful picture and great composition! Dear RH, we are at the very northern end of Scotland, sitting in the cosy hotel lounge in front of the open fire 🔥 and enjoying life. It’s like in Norway 🇳🇴 at some places here. lovely still life. I just bought myself a camera today. I have just used my I-phone until now so I have a lot to learn. Enjoy the Farnes. Nothumberland is one of my favourite places to cycle camp. we are already at the very northern end of Scotland. Great 👍 landscapes, fine whisky 🥃 and cosy hotel. Unfortunately we had quite a wind at the Farne Islands so we could do our planned round trip by boat 🚣 but we had been holydaying at the Farnes before. We will hopefully be up in Orkney in July. Hope you enjoy Scotland. We enjoyed the very north of Scotland very, very much and had a great time on the Orkneys. Weather was more Italian than Scottish 🙂 Coming back south is a kind of a culture shock. good luck and happy cycling. We met a lot of cyclist up North. Beautiful lighting and combination of objects! Dina took this photograph with natural light from a big west facing window. The combination of objects followed our studies of Baroque emblemata. It took us quite a while to combine all those objects in the way of a philosophical idea. Liebste Grüße, bleibt ihr noch lange verreist?! thank you so much for your kind commentary 🙂 🙂 🙂 🙂 that made us very happy. I love this still life! The colours, the composition, I love it all. thanks for your commentary. We love still lifes as well and try to persuade Dina to do more. the classic still lifes you find in Dutch and Belgium museums, as there was a tradition painting still life in Flanders. Even though not the same place, my Grandma (Paula Hilmida) was born in Germany. She always seemed to be doing needlework and sewed beautifully. She admired Johannes Vermeer’s portraits. Wildly incredible shot!..Absolutely beautiful!..Wow! It is both puzzling and lovely! Perfect! Thank you so much for your kind words 🙂 🙂 we are VERY happy about your commentary! Thank you very much for reblogging our post 🙂 🙂 we are very happy about. Do you love this still life too?